I've had a remnant of last summer's Alaska trip that I finally got around to fixing. Somewhere along the way, the strap that retains the outer rear corner of the fresh water tank pulled out of the floor. Since I was going to pull out the curbside seat to replace the retaining straps I figured now was the time to install a cleanout port in the water tank as well. I ordered a JR Products 5" deck plate from Amazon for the project. The tank was previously drained of as much water as possible. As usual, I used my small trim router to cut the hole for the retainer. The tank was soft enough that I likely could have used a knife instead which wouldn't have made as much mess in the tank. Stainless steel panhead screws with lock washers and plain nuts were used to attach the ring to the tank. 3M5200 sealant was used under the rim of the ring with a dab on each screw as well. I double-checked each screw to insure there was some sealant on the threads which will keep the nuts from backing off due to vibration. The lid has an o-ring on it and screws into the ring to make a waterproof cover. Now it is possible to clean the inside of the potable water tank should it be needed. On Christmas Eve we went in to Anchorage on the hunt for a poncho liner at one of the military surplus stores in town. Our first stop was a shop near the ceremonial start of the Ididarod. Yes - it was cold - still minus numbers as we approached noon. The store didn't have what we were looking for, but did have "David Livingstone" hats in stock. Wouldn't have thought there was much demand for them here. We did find the poncho liner at a different store on our way home once we were finished in downtown. We stopped at the F Street Station for lunch but didn't get any pictures. The view of Denali was wonderful - about 100 miles from downtown. The joys of clear, cold weather! 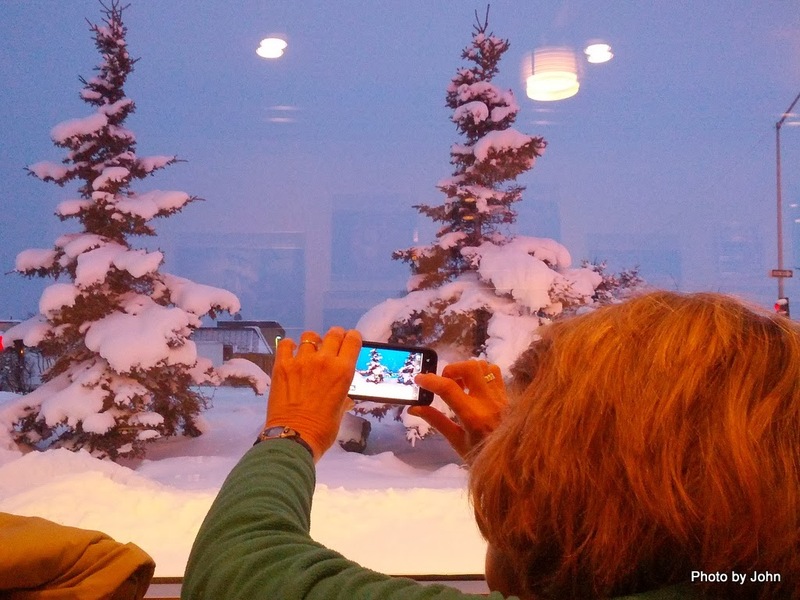 For our friends thinking of Alaska trips this summer, don't expect the Anchorage Visitor Center to look like this by the time you get here! We're starting to watch southbound flight numbers. It's been fun but it's time to get back to doctor appointments and boat building. Our visit with the Anchorage contingent has been wonderful with a few more days to go. One day the weather got up to almost 30 degrees which resulted in snow all day. Most of the time it has been a bit more chilly, but not bad. I will note none of us have suggested a winter camping trip! The neighborhood looks like a Christmas card with snow on all the roofs and many of the driveways. We have become familiar with Alaskans' favorite winter tool although it has really been for just a day or too with clear skies the rest of the time. Church on Sunday was a special experience. Lots of Christmas carols sung while watching the snow fall on the other side of the windows. It's the first white Christmas for us since 1985 and we're enjoying every minute! I trust that you and your families enjoy a Blessed Christmas. The grandson's hockey team has been involved in a tournament this weekend, so we've had 4 games to enjoy & we're off to the Alaska Aces game tonight to see how the pros do it. It's been fun to watch his skills continue to grow. And to watch how the other teams play and are coached. Watching the spectators was fun too. These two get the prize for be the most knowledgeable - more so than the coaches, players, or game officials. They were the loudest and most obnoxious as well. In between games, we went out to eat where BJ tried to get a picture of the cold white stuff hanging on the trees - something we hope not to see at our house! Not sure what all else is on the agenda this week other than good times with the family. It was a minor Christmas miracle. Certainly not like the virgin birth of our Saviour, but still pretty impressive. One of the benefits of having a son flying for a major airline is the parental flight benefit, assuming seats are available. His airline introduced a non-stop flight from Phoenix to Anchorage that started yesterday, and through the vagaries of crew scheduling, Jeff was the Captain for the inaugural flight. He suggested we try to come to Anchorage for Christmas on that flight if seats were available. As we watched the loads in the days preceding the flight, it seemed that it would be a workable option, but on the last day, the number of available seats dwindled rapidly and the number of pass travelers increased, making it a pretty long shot. Since we were going to the airport anyway (Jeff had spent the night with us) we packed in the hopes that we would get on. The crew did their preflight prep and the ticketed passengers all filed down the jetway while the numbers were crunched. At the last possible moment, we did get on the flight. Center seats in different rows never looked so good! Every available seat was filled. 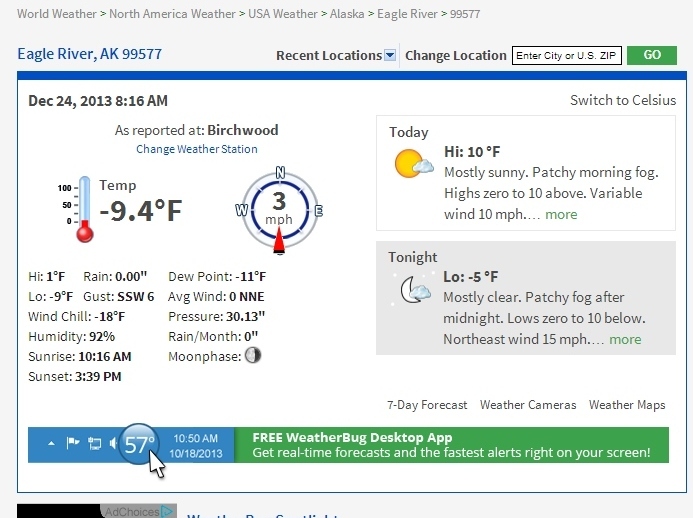 Landing in Anchorage, the temperature was announced as 0 degrees Farenheit in blowing snow. After clearing snow off his truck, the bags were thrown in the back for the drive home. It was cold enough that they didn't get wet. Spencer greeted us at the door and immediately, he and BJ started working on a "gingerbread" house. Today is Spencer's last day at school. Looking forward to a week of fun with the family! While the Alaska contingent were here for our daughter's wedding, we took them for a hike to Hieroglyphic Canyon. Spencer was studying Native American art in school, so this visit to a well known petroglyph site was a logical choice. The trail head is a bit challenging to find at the end of the road north of the Gold Canyon community but the map link is in the right place. The trail rises about 700 feet in a mile and a half to arrive at a pool. This time the creek was flowing. Often it's not. For the most part the trail is unshaded and can be quite hot. With two Search & Rescue members in the family, I'd get shot if I didn't mention TAKE WATER with you if you do this trip. The trail has large rocks and is rough in places. There are a lot of petroglyphs on numerous panels across the creek from where the trail ends. Much of the trail passes through a saguaro forest. while others are very different. Any sunny morning hike in the Superstitions is best completed with lunch at one of the few In-N-Out Burger locations in the Phoenix area. The nearest is south of the freeway on Signal Butte in east Mesa. and then storyboarded all of the points for the bulkhead. We'd never used the technique before, but Brad Dimock did a great job of documenting the technique on his Fretwaterlines blog. 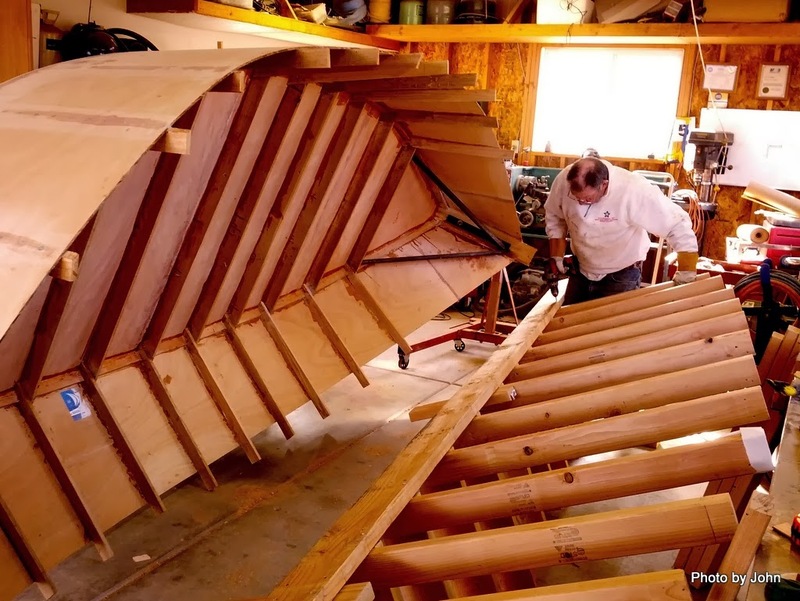 Brad is a long-time Grand Canyon boatman who has written some excellent biographies of several early river runners and now builds boats in the off season. Once we had all the details on the storyboard we were able to move the lines to a sheet of merranti plywood for Tony to cut out later. We finished the day by gluing and screwing the spacer in place and then applying epoxy to the remaining bare surfaces on the boat's interior. and stopped in Nothing, Arizona for a snack and a look around. Once a town with four residents, it is now an uninhabited wide spot along the highway and terminus of a couple Forest Service roads..
and gate house were all that I saw of the place on a Wednesday midday. The nearby BLM dispersed camping area was nearly empty with only four rigs in sight. Looks like some interesting hiking in the area although the signs suggest that it may be busy with ORV, especially on weekends. Home now, with a box from Amazon waiting. More projects on the horizon. 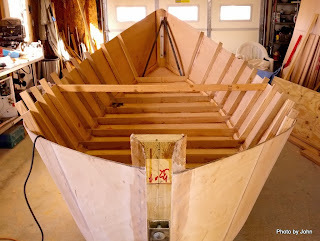 We've made a lot of progress on the dory in the past couple days - much of it not terribly obvious. After filling the screw heads, the boat sat overnight with a heater under it so that the epoxy would cure in spite of the low temperatures we were experiencing. First project the next day was to trim the excess from the plywood bottom. Tony is doing his Mr. Wilson impression. 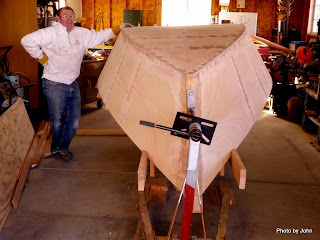 Once the bottom was trimmed and yesterday's screw head fillings scraped and sanded, we lifted the boat and the strongback into the "flipper" - a pair of engine stands that Tony rigged to allow easy rotation of the boat. We rolled the boat about 60 degrees so that we could get easy access to all the screws to remove and disassemble (or disassemble and remove or a little bit of both) the strongback. Lots & lots of screws holding the strongback together but with two guys and two drills, it didn't take too long to get it disassembled. Getting the boat right side up for the first time was a big step. After cleaning the excess squeeze-out from ribs / side panels, the entire interior of the boat was sanded before we began the more than one day job of filleting all the joints and epoxy coating all the interior panels. Once that is all done, the boat will be ready for bulkheads, hatches, and all the rest of the interior fittings. After we finish the epoxy tomorrow, I'll be headed home. Hope to come back again in early January for glassing. With Kelli's wedding in the rear view mirror, I grabbed the trailer and headed out to Bullhead City to help Helen and Tony build a dory. Not just any dory - this one is a replica of the Susie Too - an early commercial boat in the Grand Canyon. This one is being built for Helen to use on a private Canyon trip in March. Tony is furnishing the garage and lots of labor while Helen keeps her kayak and canoe livery running. which took three steps, pilot and clearance bores plus countersinking. Went much faster with two people. 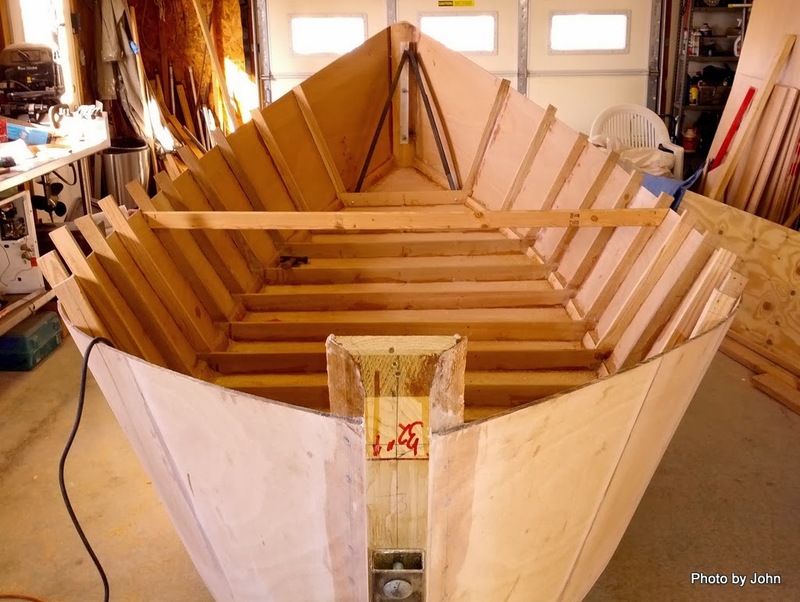 With all the holes ready, we tipped the 1/2" plywood bottom skin up again, painted epoxy on the mating surfaces and added thickened epoxy to the ribs and chine before lowering the bottom skin to the boat for the last time. After installing six gazillion screws, Tony marked and trimmed much of the excess from the bottom skin while I crawled under the boat to remove any squeeze-out of epoxy from the ribs. This is one time when it was nice that it was a cool (nearly cold) day so the epoxy didn't set too quickly. We filled all the screw heads with thickened epoxy and set an electric heater under the boat, hoping the little heater would create enough heat for the epoxy to finally kick in the cool (nearly cold) weather we're experiencing. Can't do anything more until the epoxy cures! The cold weather is tonight when it's supposed to drop below freezing.